Convert XPS to ten target formats. Specify page size and resolution. Specify color depth and compression algorithm. VeryPDF XPS to Any Converter can convert XPS to PDF, PS, EPS, JPG, BMP, PNG, PCX, GIF, TGA and TIFF. For conversion from XPS to TIFF, it can convert multipage XPS to multipage TIFF. VeryPDF XPS to Any Converter can convert XPS to JPEG, BMP, PNG, PCX, GIF, TGA and TIFF, and set the resolution and page size of created images. The conversion from XPS to PDF, PS and EPS, page size and resolution are kept from the original XPS. In conversion from XPS to image formats, it can set the color depth and compression methods for the created images. It can also convert XPS to TIFF image that can be faxed within computer. Batch convert XPS files to PDF documents. Don't need Adobe Reader, Acrobat and other third-party software. 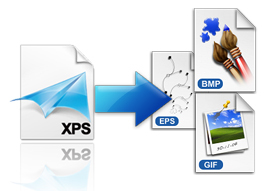 Convert XPS to ten formats including PDF, PS, EPS, JPEG, BMP, PNG, PCX, GIF, TGA and TIFF. Name created multiple images with continuous number suffix. Specify page range to convert multipage XPS. Resize page size in unit of pixel. Change color depth to 1, 8 or 24 bits. Apply compression methods including CCITT Group 3/4 fax encoding, LZW compression algorithm, PackBits, Faxable TIFF, etc. Option to convert multipage XPS to multipage PDF or single page PDF files. Support owner password and user password protected PDF files.